Patriot Disposal provides trash and recycling services for the Broadlands community. An environmentally-conscious company, Patriot Disposal offers a curbside recycling program that extends well beyond those offered by other haulers. Questions? Patriot Disposal considers it a privilege to serve you. Please direct any questions, comments or concerns to us at our office, 1-703-257-7100. LARGE ITEMS: Please call Patriot Disposal to arrange a pick-up day 1-703-257-7100 – i.e. small furniture, mattresses, bed frames etc. Trash must be properly secured in plastic bags, standard trash cans, or wheeled carts. Trash bags and containers shall not exceed 50 pounds in weight per bag or container. Trash may be placed at your curbside the evening before your pickup day, however, must be placed at the curbside and/or designated area by 7 a.m. for collection. It is a violation of our covenants to leave or store your trash/recycling bins in public view if it is NOT a pickup day. Holiday Schedule: Patriot Disposal will provide services on all holidays that fall on regularly-scheduled pickup days with the exception of: Thanksgiving Day, Christmas Day, and New Year’s Day. Please be sure to bind newspapers with twine or place loose papers in paper bags before setting out at your curb. Weigh down your bottles, plastics and cans by placing heavier recyclables on top. Ensure that the lid of your trash can is tightly secured. Put smaller lightweight bags of trash together in a larger heavyweight bag. Don’t put trash out early and PLEASE no loose “peanuts” or other packing materials. Lastly, if the trash does blow over, please pick it up even if it isn’t yours. Your HOA assessment provides for curbside trash removal. There is no budgeted amount for litter removal. The Association relies on homeowners to keep their neighborhoods free of litter and their assessments reasonable. 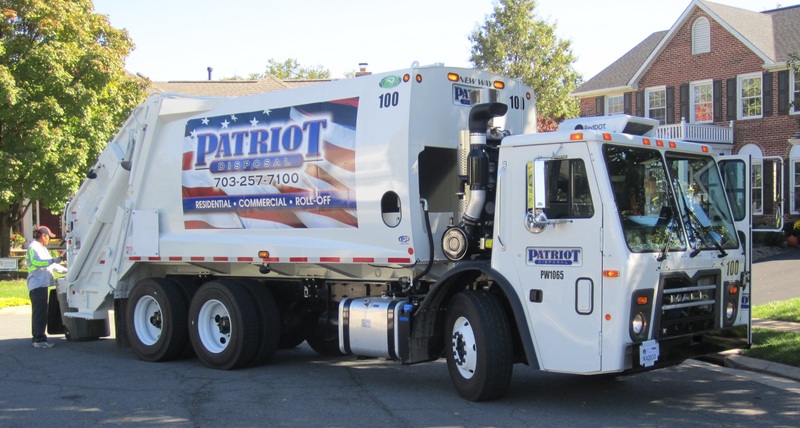 Patriot Disposal provides one wheeled, covered Toter for each residence for the collection of trash. Each town home will be provided with a 64-gallon, and each single-family home will be provided with a 96-gallon. Each town home and single-family home will also be provided with one recycling Toter. Keep a Lid on It! Get Your Lidded Recycling Toter For Free! Residents are encouraged to use Patriot Disposal’s lidded recycling toter to prevent litter from collecting in our neighbood. Residents who currently have the smaller open recycling bin through Patriot Disposal may swap out for the larger covered recycling toter at NO ADDITIONAL COST. This will help prevent trash and debris from littering our neighborhood and make it easier on Patriot Disposal to remove your recycling. The dimensions for this 64-gallon lidded toter are 31.75″ (L) x 24.25″ (W) x 41.75″ (H) compared to the smaller open bin dimensions, 19″(L) x 16″(W) x 15.5″(H). Please contact Patriot Disposal at 703-257-7100 to make this request. You are encouraged to keep a record of the serial number of your toter(s) should you need to identify it in the future. Overview of: What Can Be Recycled? Patriot Disposal’s weekly curbside recycling program includes newspapers, mixed paper, cardboard, paperboard, glass bottles and jars, metal and aluminum cans and plastic bottles. Each Thursday, Patriot Disposal will remove recyclable materials that have been placed at the curb for collection. Newspapers and magazines should be bundled and placed in paper grocery bags or tied with heavy twine. Glass, plastic, aluminum and metal, food/beverage containers should be rinsed and placed in bags, cardboard boxes, or recycling bins. Recyclables must be placed at the curbside and/or designated area by 7 a.m. for collection. Recyclable materials can be co-mingled. Patriot Disposal will remove and recycle packing boxes and cartons placed at the curb by residents. Scrap metal – Please call Patriot Disposal to set pick-up day 1-703-257-7100: i.e.foil, pie tins, trays, pots and pans, small car parts, grills, bicycles, swings, etc. Patriot uses a special truck for these recycling items and requires advance notice. Yard debris (leaves, grass clippings, brush) may be mixed with trash only during the months of January, February and March. Yard waste may not be mixed with recycling. Brush must be cut into four-foot lengths, with limbs no larger than six inches in diameter. Brush must be tied in bundles no larger than two feet in diameter. Yard debris must be placed in separate containers, marked “yard waste” or in biodegradable bags. Yard waste that is put out at the curb in plastic bags will not be picked up. Yard waste must be placed at the curbside and/or designated area by 7 a.m. for collection. Food waste mixed in with yard waste will be accepted, as it can be composted. The weight limit for yard waste is 35 pounds per bag or container. Electronics, used motor oil, auto batteries, appliances and scrap metal such as foil, pie tins, trays, pots and pans, small car parts, grills, bicycles, swings, etc. Please call Patriot Disposal to arrange for pick-up. Some items may incur a charge. Please ask the customer service representative when you call. Please note the following requirements concerning the collection of special items: (1) Items for collection must be placed at the curbside and/or designated area by 7 a.m. (2) Appliances containing Freon must be certified as “Freon-Free” prior to removal. The following Unacceptable Waste items will not be collected, and should not be placed in the trash or set out for pickup: highly-flammable substances, hazardous waste, construction debris, liquid waste, toxic materials, radioactive materials, asbestos, infectious or medical waste, petroleum contaminated soil, dead animals, paint, manure, or other dangerous materials as determined by state, federal or local law, or in the reasonable judgment of Patriot Disposal.